The formation of this orchestra is not fixed, it depends on particular demands on programme and interpretation. 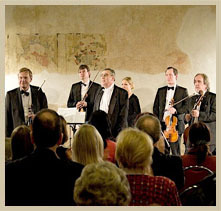 The orchestra performs from a small baroque formation to the formation of early-classicistic orchestra. Its core repertoire consist of compositions from baroque to early-classicism, but the orchestra interprets also works of other music periods.